As a man was passing by a group of elephants, he noticed that one of the elephants was leashed to a small stake on the ground using a flimsy rope tied around one of its legs. Surprisingly, however, it wouldn't attempt to break away even though it could pull out the stake with just a budge of its huge legs. Filled with wonder, he asked the trainer why it was so. 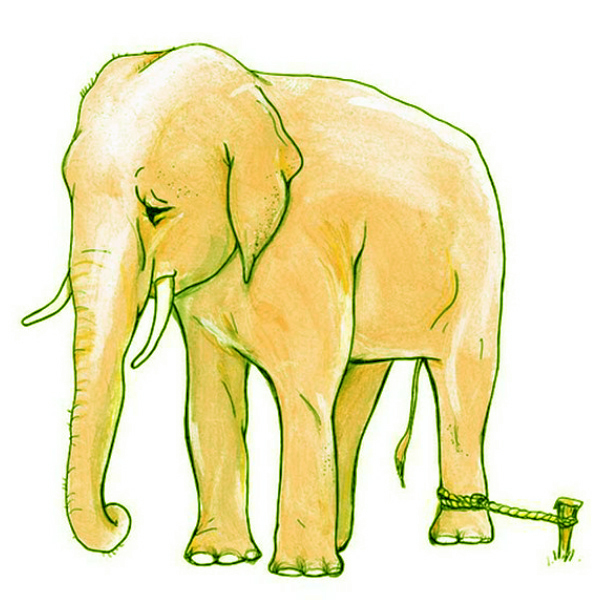 The trainer told him that, when those elephants were younger, they were restrained using the same set-up. A few times they tried to get away but they were still too young and too weak to break the leash. And they grew up conditioned to believe that they could not break loose. I am amused by some friends who have been climbing mountains in the country for more than ten years who would insist in hiking Mt Ugo in full battle gear. They say their BMC instructor had told them that they should always have a compass, a rope and a waterproof match! They make sure there's nothing left unticked on their to-bring list. Sleeping bag, check; multi-fuel stove, check; emergency blanket, check. Some just can't let go of these things. The old-school mountaineers have successfully passed on to many the mental conditioning that climbing Mt Ugo is (still) mountaineering. And then I hear of 9 trail runners (3 males 6 females) who ran the Bakun Trio route in 2015 in less than 12 hours! I guess what I'm saying here is that, there's something not so right about how a lot of us look at the activity of climbing mountains in the Philippines. A considerable lot of us think that climbing mountains is just an alternative recreational activity. Anyone can do it but one should expect that it is, by nature, difficult and the only way to get around this is to attend a lecture called BMC and equip oneself with gear. On the flip side, there are these trail runners whose objective is to find 'runnable' trails. The summit? Some of them don't even realize that it's already the summit of Mt Sembrano. You see, many of us have been conditioned to believe that whenever there is 'Mt' in the name of the activity, it is automatically mountaineering. We have failed to acknowledge that times have changed. Many of the hills we call mountains have been reduced to hiking destinations. The trails are already well-established, sometimes with hand railings. Most of us believe that climbing a mountain is hard and there's nothing we can do about it. We fail to acknowledge that with regular training and a fit body, we can easily negotiate the trails that have become rather convenient. Everyone can become big elephants. We should start to understand that climbing mountains, whether in trail running, hiking, trekking or mountaineering, is a SPORT and not just some sort of ALTERNATIVE LIFESTYLE open to everyone with or without proper training. Unless you start looking at it this way, the LONG TIME, THE BATTLE and THE GEAR will always remain constants in your equation. 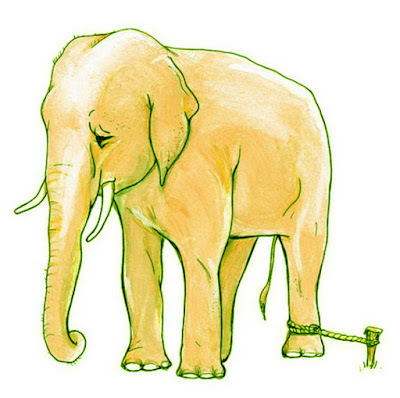 You will always be the small elephant restrained by the flimsy leash. I am equally amused by novices who want to take on an extended day hike (EXTENDED ftw!!!) of Kibungan Cross Country (CROSS COUNTRY, another ftw term) only because they know of some individuals who have dunnit. FYI, some things are just not meant for baby elephants! Time and training are essential for bigger things. If you know a self-proclaimed mountaineer who needs to start training, share this post.